Before I get to today’s recipe, I want to tell you about a Breakfast Program for kids called Toonies for Tummies. Toonies for Tummies helps fight child hunger in schools by providing breakfast every morning before hungry children head off to class. The money raised helps as many as 75,000 children across Canada. It is estimated that as many as 1 in 5 children go hungry every day in the neediest communities across Canada. You can donate $2 at your participating grocery store or you can donate online here. I think it is a great program and it is such an easy way to make a difference in the lives of children who really need it. Growing up, Wheat Thins used to be one of my favourite ‘boxed’ crackers to buy at the grocery store. When I heard that I could make them at home for much less money and without any strange preservatives I was very excited. I made a half batch because I wasn’t sure if I would like them or not, but I really wished that I made a full batch, so I posted the full batch recipe below. 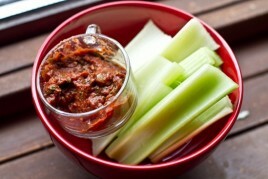 Crispy but chewy, wholesome, and the perfect vehicle for your favourite dip or spread. 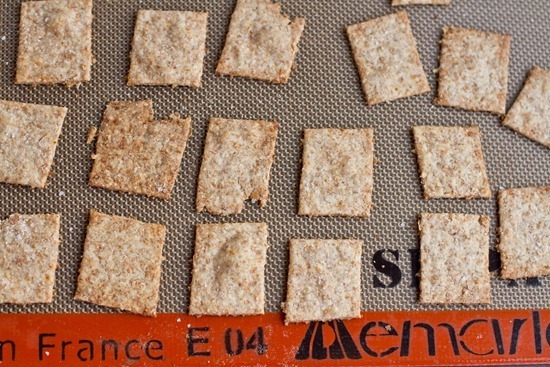 These homemade wheat thins exceeded my expectations. They are my favourite (and easiest!) homemade cracker to date! Adapted from Tracey’s Culinary Adventures. Original recipe from King Arthur’s Cookbook. 1. Preheat oven to 400 F. Line two baking sheets with parchment paper or a non-stick mat. 2. In a large bowl, whisk together the dry ingredients (flour, sugar, paprika, salt). 3. 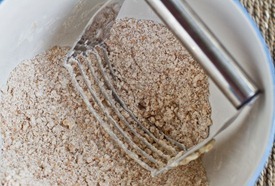 With a pastry blender (or two forks), cut in the Earth Balance or butter into the flour mixture until crumbly. See image below. Now mix together the water and vanilla and then pour into the flour and Earth balance mixture. Stir this mixture until it comes together. I got in there with my hands and really squeezed the dough to help it come together. If it appears dry add a touch of water, but you don’t want it sticky. 4. Split the dough in half. 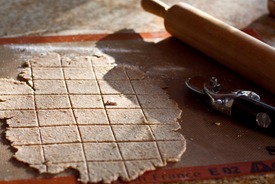 On a floured surface or on a non-stick mat, roll out one half of the dough very thin (1/16th inch). Using a pizza cutter, cut into whatever shape you desire. Using a splatula, place the crackers on the prepared baking sheet. Repeat as necessary. Sprinkle with more salt and sesame seeds if desired. 5. Bake for 8-10 minutes, watching closely. Half way through baking rotate the pan to ensure even baking. My crackers took 10 minutes, but if you do not use a baking mat it will likely take less time for you. Be careful because they burn quickly. Cool completely. Makes about 64 crackers for this full recipe. Store in an air-tight container. Note: This recipe made enough crackers for two baking sheets. I baked them separately, but I am sure you could bake them at the same time as long as you rotate the pans half way through. 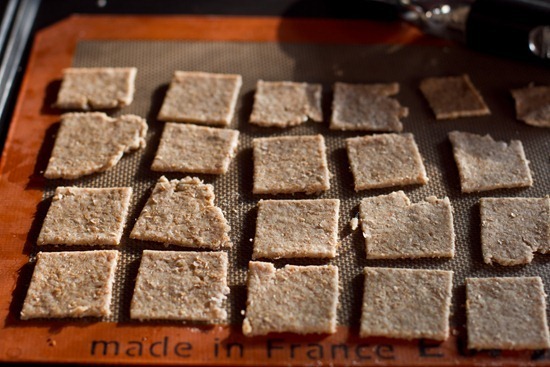 It is amazing how GOOD these crackers are with just a few basic ingredients! I love recipes that exceed my expectations. All you do is whisk the dry ingredients, cut in the Earth Balance or butter, add water + stir, and then roll out the dough + slice. I made traditional rectangles (with rustic edges! ), but you can make any shape you want! Triangles might be fun, especially if you used them in dips like guacamole or salsa. A wheat thin tortilla, perhaps? Sprinkle with kosher salt before baking. This step is key! Place on the baking sheet and bake for 8-10 minutes at 400F. I rotated the baking sheet half way through baking. In just over 30 minutes, I had delicious homemade crackers. Allow to cool if you have the restraint. 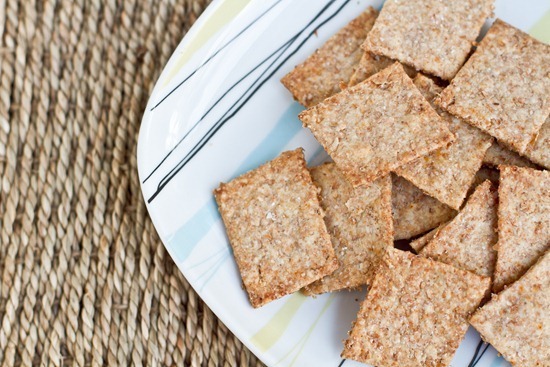 These vegan wheat thins taste a lot like the boxed version, but we think they taste even better! Eric and I both agreed that they are our favourite homemade crackers to date. You just can’t beat how short the ingredient list is and how easy they are to throw together. Growing up, what were your favourite boxed crackers? What are your favourite crackers today? I think my all-time favourite boxed crackers were the Swiss Cheese Crackers (lol), followed by Sour Cream & Chives and Wheat Thins. Oh and I LOVED Ritz Cheese Bits! I’d have to say my favourite crackers growing up were triscuits and wheat thins. Now I like Mary’s organic crackers and Kashi crackers, but they are expensive. Thanks for the recipe, I will have to try them. I love wheat thins! I used to eat them with tuna fish all the time:-) I need to try this recipe!! So nice that you posted about the breakfast program. Growing up I loved the swiss cheese crackers as well! Same with the ritz and cheese sandwich crackers. I LOVED the Ritz Cheese sandwiches! Wheat Thins were definitely a pantry staple when I was younger too, but now my faves are Triscuits (now there’s a baking challenge for you!!!) Great info about the breakfast program, I think it’s such a great cause. Making crackers has always intimidated me for some reason, but now I might have to give it a try! I used to (and still do) love wheat thins and Ritz. I’m also really loving Triscuits with rosemary and olive oil these days.. mmm! I loooove wheat thins but haven’t had them in ages! 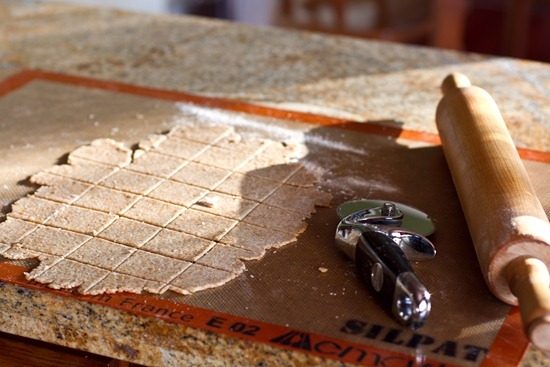 What a fantastic idea to make homemade crackers! Wow, I can’t believe how easy this recipe looks! This is something I might actually be able to pull off! I love Wheat Thins but stopped eating them recently when the ingredient list freaked me out. Love this option — thanks for sharing! So glad to see you mentioned the hunger problem in our communities. I started volunteering at a local food bank in November and what I see there would break your heart. The thing that upset me the most this week was to see that the donations have pretty much stopped now that the Christmas food drive is over. I talked with others who have worked there for years and heard that other than a slight increase during Easter, donations will pretty much stop until Thanksgiving. This means we’ll run out of food to give out to clients in the meantime. So thank you for bringing this hunger issue to light. Maybe some of your readers will even consider dropping off a few non-perishables at their local food banks! I’m partial to a good Wheat Thin or Triscuit because I think Nilla wafers don’t count as crackers! I love making my own crackers! I am excited to try this wheat thin version. Normally, I just use flour, butter, salt, and a homemade vegetable puree (sweet potatoes, tomatoes, peppers, onions, carrots, celery) in place of the water to make veggie crackers. Can’t wait to try these! wow–those look amazing! and very authentic. Oh my goodness, wheat thins are like CRACK for me!! I’m glad to have this healthified recipe! As a kid, I loved the Ritz cheese sandwich crackers. I had some recently, on a nostalgic whim, and trust me, they are nowhere near the same as I remember them – ick! I’m proud to say that I think my tastes have matured a bit. 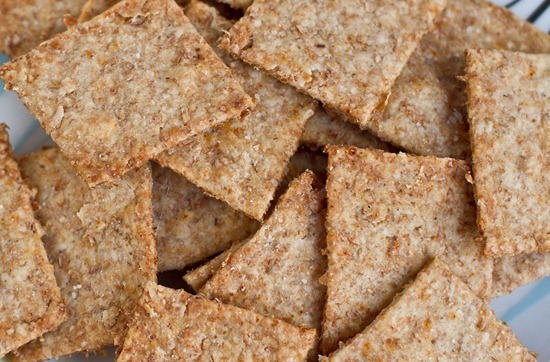 But now, I love Wheat Thins (so I’m really excited to try this recipe), and Vegetable Thins. I loved Wheat Thins! And Ritz crackers. But now I’m into Triscuits. I wouldn’t say it is integral by any means, but I do think it makes the flavours pop a bit. I’m sure you can play around with it! We loved Triscuits! But we didn’t eat too many crackers. I really loved saltines too. Toonies for Tummies is a great program. It breaks my heart that children in this country go hungry and if all it takes is a couple of dollars I am more than happy to help! This recipe looks amazing! I loved wheat thins growing up and my boys love them now. I buy very few boxed crackers and the ones I buy they won’t eat so I am definetely making these and I know they will love them. Did you use whole wheat pastry flour or just whole wheat flour? I love most kinds of crackers. Even when they don’t taste very good, they are crunchy which is absolutely enough for me. I’m easy to please :) . These wheat thins look very good and the recipe is simple enough for me so I will definitely give them a try. My favorite were and still are Wheat Thins! So…I think I will need to try out this recipe!! LOVE Wheat Thins but I never eat them because of the ingredients list. I’m so glad that you posted this! I will be making them ASAP! WOw, that’s so simple!! I love Wheat Thins but I actually banned myself from buying them because I literally will eat the entire box in one sitting! Nowadays I really only eat crackers with soup if I am sick. I don’t buy many from the store! When I was younger I loved Club crackers — they were so salty and so delicious! And cheeze-its were always in our house, so I ate my fair share of those too! 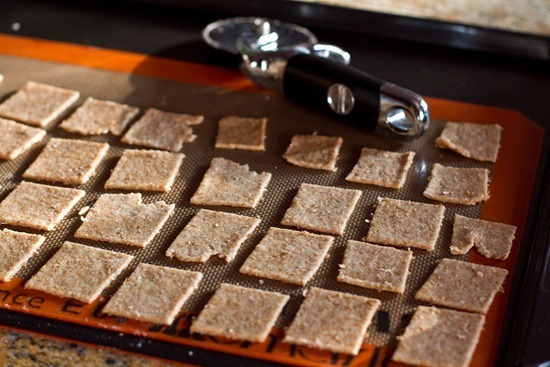 I love wheat thins…and I love that now I can make my own! Yum! I have to figure out how to make these gluten free. Wheat thins were one of my ultimate favorites. They were so salty and delicious. When I was going through my many growth spurts I could easily polish off a box a day. Yum! Great recipe, and thanks for sharing Toonies for tummies with us, sounds like a fantastic program! They look so similar to the real thing! I loved Wheat Thins growing up. The only cracker that beat them was Saltines and only when I was sick. Ahhh as always, you have completely made my life. I am such a cracker addict but reaally dislike the long ingredient lists! I have been wanting to make my own and now I can! Weeeeee!! Thanks again for like the millionth awesome recipe :D Oh and PLEASE make the Ritz Cheese Bites! They used to be my fave! Similar to you, I used to love eating Wheat Thins in college but gave them up when I found out they weren’t as “healthy” as I thought they were. I’m going to have to try this! i loved wheat thins! these look so easy to make.. definitely will use this recipe when i want to make my own! These look great! The combination of vanilla and paprka is interesting. Wheat thins and triscuits were always my favourite crackers! I cannot wait to try this recipe. I can’t believe the short ingredient list – I’ve never made crackers before, but I will definitely start if they are all this easy!! I think these crackers will be especially delicious with your totally awesome hummus recipe. I go through a batch of that every week and I am always looking for something new to have it with! Triangle crackers would be great dippers! I have been on a homemade cracker kick lately so I cant wait to try these out! Fav crackers when I was little were probably wheat thins now I love crackers with lots of seeds and herbs! I’m going to try and switch applesauce for the butter, to make it a little fruity, and a lot-less calorie filled..
i hope it turns out as good as yours does! Growing up I loved: Ritz, and What-Thins. At University I moved to Stoned Wheat-Thins. When I went gluten free I was off crackers until Mary’s Crackers came out. Yum! Triscuits! TRISCUITS! They are like crack to me. I love the new Balsamic Basil ones too… they taste like pizza. But I don’t let myself have them because of the long ingredient list. Maybe you could veganize them for us? 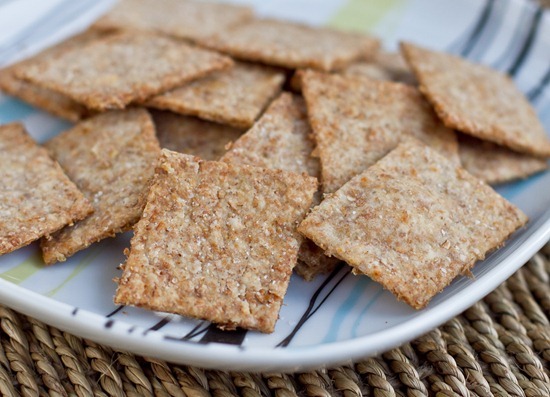 My boyfriend is going to FLIP when I make these, Wheat Thins are his favourite cracker! Mine was actually Vegetable Thins, I could eat a whole box! Yummy! Im not sure…it would be an experiment! I’m definitely making these this weekend. Do you know the nutritional profile for these (total fat, carbs, protein and fiber) for WW purposes? Thanks! Ohh – these look ridiculously good! I should make these for my mom. I’m not a big fan of crackers, I would usually just eat whatever was in the cupboard. Love crackers! Ritz and Pepperidge Farm goldfish crackers were my favorites! Wow, these look delicious! I can’t wait to try them out! I am always looking for ways to make favorite grocery store items homemade! haha not sure…Ive tried a nooch cracker before and it was a bit off. I’ll have to see what I can do! I am surprised how simple the ingredient list is. Like you said, I don’t like eating too many foods with all the mystery ingredients/preservatives. I find it so satisfying when I can make something like this at home, knowing exactly what went in it, and recognizing all of it as food! Thanks for the recipe Ang! I’m going to gluten-free these up! These look great! Although I might spice mine up with a bit of parmesan and cayenne. I think they would definitely work in a dehydrator too! Not sure how long though, but Im guessing not too long since these only took 10 mins! I always love your cracker recipes! i tried a previous cracker recipe that you made and it was a huge success. and now homemade wheat thins? i’m SO in! Yum, these look great! I used to love Wheat Thins as a kid and can’t wait to try these. these look so much better than any store bought cracker, hands down! I loved Ritz and Vegetable Thins growing up, and now my fave are Wheat Thins and Kashi Honey Sesame :) Maybe I’ll try my hand at cracker-making! My husband eats Wheat Thins every night! I’ll have to try these and see if he likes them! I lived for Wheat Thins with cream cheese. I also loved Cheez-Its. Pretty much anything cheesy, I ate it. 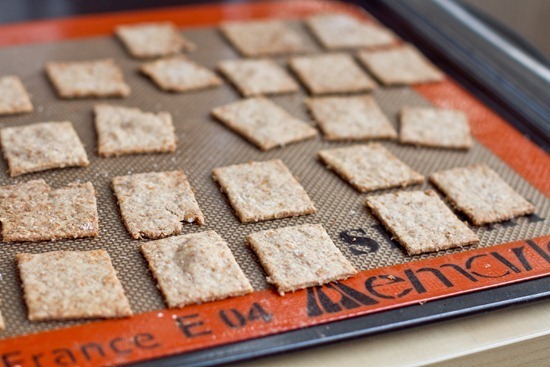 Must make these, I LOVED wheat thins as a kid! We only had saltines in our home for the most part. However, Ritz crackers were a TREAT!!! Angela, these look awesome! It would be fun to try various flavors. I wanted to mention that my boyfriend bought triscuits recently and i was shocked that they only had a few ingredients in them. Boxed wheat thins however have quite a few more. Triscuits with slices of cheddar cheese. Mmmmm. Definitely a childhood favourite!! When I went to school, I was one of those kids that used the breakfast program. So thank you for donating, even though I’m not using it anymore! My husband LOVES wheat thins!! I can’t wait to make them! Oh my god! Saving this post. We just bought a Kitchenaid Mixer so I want to try it out and this would be perfect…the bf is addicted to Wheat Thins! My favorite boxed crackers were vegetable thins, swiss cheese crackers and ritz! There is a breakfast program here in Quebec that does the same as Toonies for Tummies. They give breakfast to 15000 children on school days! I love cheezits, goldfish, wheat thins, & triscuits still! Salty food is my weakness. I can do without the sweets except for dark chocolate! Wheat Thins are one of my faves too! I’m kind of a cracker fiend, so I rarely buy them for fear of eating the whole box :) Two of my current faves are Eco-Planet Non-Dairy Cheddar Crackers and Milton’s Everything Snack Crackers (or Trader Joe’s version). Oh, and Whole Foods version of Ritz are vegan and amazing. See? Cracker fiend. I love Wheat Thins! Can’t wait to Try this! Wheat Thins would always top my list of favs growing up but Stoned Wheat Thins (the big ones!!) with pb or cheese whiz would come in a close second :) Thanks for the recipe Angela!!!! I saw these on her site and am dying to try them, too. WT were always a fav of mine! I was NO KIDDING just craving some wheat thins…!!! SO gonna make these babies asap! I’ve always loooooved goldfish crackers… the original. They’re still one of my favorite snacks, and I love to dunk them in vinegar ;-) Strange, I know. 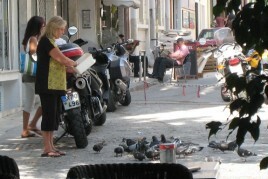 I do the same thing with triscuits and saltines! 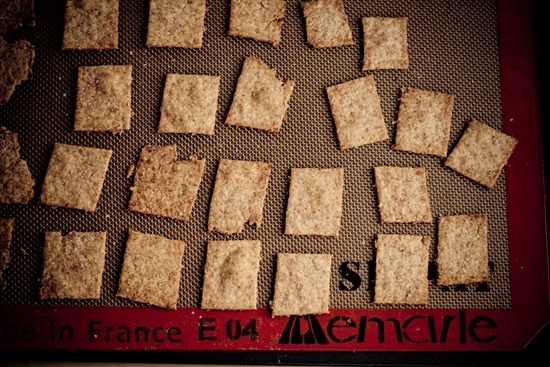 Your wheat thins look great- I’ll have to try them out next time I have friends over! Having an unexpected day off and a fully stocked pantry of baking ingredients is dangerous, I want to make everything I am seeing on everyone’s blogs today!! I just made some amazing muffins now I want to make these!! I might have to. Really want to try these- I love wheat thins! Wow! I’m going to make these tonight! What do you think you could add to make it a tomato-basil type of wheat thin? Those are my favorite but I’m not sure how to get that flavor in there.. I think my favourites growing up were a toss-up between vegetable thins and breton crackers. Both SO good!!! Wheat thins were always my fave! I am in love and bathing in this new soy free EB! love it! Awesome, Angela!! I’ll definitely be trying these out! This is definitely one of the most appealing homemade cracker recipes I’ve come across. I need to make them! I loved Wheat Thins as a kid, but nowadays the only crackers I buy are Kashi and Back to Nature. I love the idea of making my own, and I think this recipe will be my first foray :). Those look AMAZING!! LOVE crackers and I can’t wait to try out the recipe! Thanks! My favorite boxed crackers are Wheat Thins, too, so I’ll have to try these! I can’t believe that they’re so simple that I already have all the ingredients at home. Yum! I’m putting these on my ‘must bake’ list for the weekend. They look delicious, I have all the ingredients, and maybe they can break my addiction to Stacy’s Pita Chips. I was a Thin Mints and Ritz Bits girl all the way as a child. I also liked crackers shaped like ducks called Quackers, but I don’t even know if they still make them! I am definitely going to try your recipe. My husband will love these! These look so delicious! I try to avoid wheat thins since they contain HFCS–these sound like an awesome way to make them yourself!! I always liked Chicken in a Biscuit, although I still don’t understand the name. Was it supposed to taste like chicken? – because it didn’t. These were definitely always a favorite cracker of mine along with Saltines + Ritz. They look great Ang!! I love making crackers and these look amazing! I think Wheat Thins just offered you a job…but yours look even better than theirs! I loved!!! Triscuits, Wheat Thins, Ritz, Saltines, you name it, growing up and in my early 20s til i figured out my gluten issues, I used to eat crackers like it was my job. They say you sometimes crave your allergens, well I sure did! Great work, Angela..they are beautiful! And i love the short ingredient list! Ok i am going home to make these. So glad i found this recipe! I never buy wheat thins because of all the stuff that is in it that i will refuse to eat. You’re full of great ideas this week! These look fantastic and perfect for hummus-dipping. I’m loving the Trader Joe’s Salt + Pepper Lentil chips right now. These look amazing–so much like the real thing. But as you say, BETTER! how very eerie. I was only thinking yesterday that I need to start making my own crackers and then WHAM! here is your post!!! 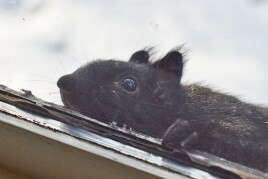 I am new to your blog and can I just say I must have been on it for an hour! It’s fantastic. You make me want to be vegan :) In all seriousness, I’m so happy though, to find recipes that are and that I really want to try, especially those wheat thins!!! I also found your post of when your hubby was quitting coke. I read every single comment because I’m trying to hard, I am truly addicted to diet coke!!! Wow! How did no one think of this before? These look so good and easy-with simple, wholesome ingredients! Thanks for this post! I’ll def be trying them! These do look like Wheat Thins! My favorite crackers as a kid were those min Ritz peanut butter sandwiches. And the cheddar crackers with “peanut butter” filling. You should make a vegan version of those!!! More crackers??!? These look fab! I love Wheat Thins! I can’t wait to try this homemade version! 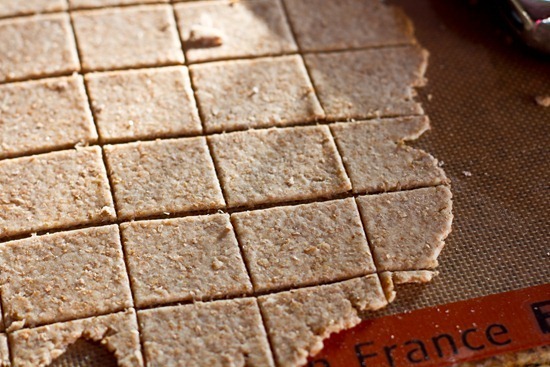 I really like wheat thins and will have to try out this recipe! Those really look like Wheat Thins! 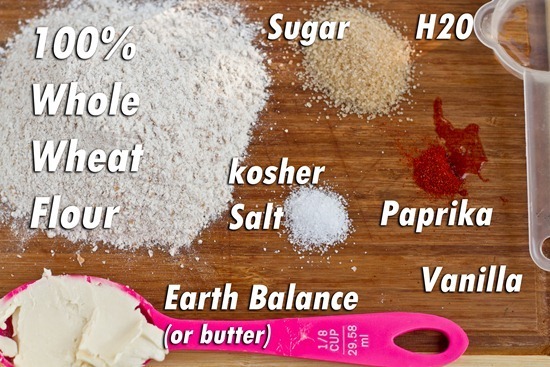 I love this recipe because I already have all these ingredients! I’ve never had actual wheat thins, but these look great! I didn’t roll them thin enough (the middle pieces are a little soft) – but overall, tasty and easier than easy. Will definately make again. Sweet Mother of Pearl! You are my hero. Also, am I blind and not seeing a box to follow you blog with google, or do you not use that? Love wheat thins! And this sounds like an easy recipe. I will definitely give it a try. I am having a party soon and can’t wait to make these! Please do come up with a recipe for Swiss cheese crackers…I know the ones you mean and love them!! Growing up I loved saltines and Triscuits! Now I’m addicted to Mary’s Crackers. Those can get expensive though at the rate that I go through them. :P This recipe looks great! Mmmm, so beats store- bought wheat thins! These are kinda similar to the crisp-bread recipe i sent you! only that has more grains and stuff in it. I use the crispbread for breakfast with whatever topping i have in the house and i keep a batch at work so i avoid the whole soggy sandwich drama at lunch! Wheat thins were definitely my cracker growing up! Then I started trying all these artisan crackers and turned my snooty nose up at it. Not anymore! Since making your recipe, my love/obsession of Wheat Thins has returned. Thanks! I just made the wheat thins and they are AWESOME. I didn’t have paprika so I added garlic and dill instead…yum! These look delish Angela, can’t wait to try them! Loved the recipe I cant wait to try it out!!!! I posted this article in my weekly link recap because I loved it so much! Thanks!!! Ha, too funny! It was funny to see the crackers cut like this because that’s exactly how I make dog treats! I am making these this weekend.Can’t wait thanks so much .As well I’m interested in Toonies for tummies..
Just made a batch. DELICIOUS. Way better than the boxed kind! Thank you! I’ve been reading awhile and finally commenting: these are fantastic! You’re my hero! My husband didn’t think crackers could be homemade, and he was right-out impressed. Thanks for this blog and sharing so many of your wonderful recipes and kind thoughts! I made these! 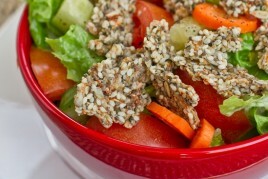 http://www.leiasdelights.com/2011/03/wholewheat-crackers.html Great recipe, thank you! I added minced onions and dill weed to this recipe it adds some great taste to them. I think I am going to try tomato and basil tomorrow I have some dehydrated tomatoes I’m going to crush and add. Not that I know of Rebecca. these look great! I can’t wait to try them with some of my homemade baba ganouj I made the other day! Luckily I stumbled across your blog reading a chatalaine. I made these crackers with a little hesitance. But good God they were delicious! My kids loved them and I loved them. (meat eater, cave-dwelling husband not so much). I burnt my freaking mouth stuffing the hot crackers into my face they were so good! Homemade crackers are the best! I have found that I like the texture a lot better if I just ripped the dough instead of cutting it. This was discovered accidentally, when one batch I made was a bit too dry and sort of fell apart on me. The edges of the crackers were my favorite! So I went ahead and just ripped the whole batch. The ragged edges of them makes for more air pockets and crunchiness! I always revisit this recipe, one of my favorites. One way to doctor it up is to mix in nutritional yeast. Then when you are rolling it out, dust your surface with more nutritional yeast. AMAZING flavor for cheez it fans like myself. Let me first say, I’m a huge fan of your website. Honestly I cook something from your blog at least three times a week. Please keep them coming! I must also admit that I reference your blog so much I actually have it on my bookmarks bar!! In my pre-vegan days, I loved Cheese Its, and I wanted to try to figure out a way to bring some cheesy goodness to your amazing wheat thin recipe. Done and done! I added about 1/4 (or more) cup nutritional yeast with about 1/4 tsp garlic powder, omitted the vanilla extract and upped the paprika just a sprinkle. They turned out amazing! A great way to have a vegan-friendly cheese cracker. The recipe I used is pretty basic but I’m sure your culinary genius will find a way to make them the most amazing cheese its ever! I hope that helps some people who get Cheese It cravings like I do! Thanks so much for your kind words about my blog!!! That made my day. Oh. My. Goodness. These are amazing! I had half the first tray finished before the second one even came out of the oven! I’ve been visiting your blog for about 2 years now, and made many delicious meals using your recipes, but this is the first time I’m commenting because the wheat thins are awesome. They are addictive and so dangerous that I keep them somewhere rather inaccessible so I wouldn’t finish them at once. I subbed cayenne for paprika, and omitted the salt sprinkle, but they turned out wonderfully. Thank you for the avocado pasta, the green monsters, the overnight oats, the walnut-lentil loaf, the banana bread, and now this. Looking forward to more news of your book! Oh that made me laugh…I have to hide these from myself too! Aren’t they so yummy and total “comfort” food? So glad to hear you enjoyed them too. Thanks for reading! I just made these and I can’t stop eating them. These are soooooo goooooood! Mine took a few minutes longer to bake, but I have the feeling mine were rolled a little thicker. I used sunflower oil instead of the butter substitute… Worked without any problems. If you are thinking of trying these, go for it! This recipe is simple, tasty, and fool proof. Thanks for sharing! I know you said you used whole wheat flour but do you thnk it would ruin the recipe to use whole wheat bread flour? I just used up the last of my whole wheat flour on making bread but these look so delicious !! Hey Lindsi, hmm I’m not sure – I have only tried it with 100% whole wheat flour. Let me know how it goes if you try it! I dove in and tried the recipe with whole wheat bread flour and still delicious! They were a little more chewy than i expected but i think next time i will roll them a bit thinner..I’m also thinking about using a bit of dried basil and sundried tomatoes to imitate the store version, my husband is addicted to them! Thanks for another great recipe! Have you ever successfully substituted the whole wheat flour with a gluten free flour? Sorry bot yet, but let me know if you try it out! I just found this recipe and made these. OMG!!! I am loving this recipe. Delish crackers and quick and easy. I have been craving crackers and something salty/crunchy since changing my diet. I have found that something. This is a keeper! Thanks girlfriend! I’m about to polish off the whole batch! these are fantastic! Great, easy recipe. The cooking time for mine was closer to 20 min. I used all-purpose flour instead of whole wheat, since that’s what I had on hand. Maybe that accounts for the longer cooking time? Do you think it would taste ok with brown sugar? These are great and so easy! I just made a second batch and subbed 1/4 cup of the whole wheat flour with flaxseed meal and it was fabulous – adds a little extra flavor and texture. Thanks for the recipe! haah enjoy Anna! We love this recipe! These look good! I love (crazy about! ) tomato/basil wheat thins:could add dried basil, but not sure about the tomato. Any ideas????? I bet you could add a touch of tomato paste. Never mind, I see that you both used the original source recipe, King Arthur’s Cookbook. Ignore me! Just what I’m looking for a perfect diet. Thanks for sharing! These look so good. I am oil-free….do you think I could sub something for the oil? I made this a few days ago and loved it. I used whole wheat pastry flour so I did end up adding extra flour until I got the right consistency. Next time I would add different seasonings (garlic, onion) because its a bit lacking in flavor but otherwise the texture and butteriness is perfect! Thanks for sharing this recipe. A new favorite at our house. I’m making a batch every few days. Do they need to be refrigerated? Next post: What’s Your 6-Word Love Story?